I finally found this cereal at a small liquor store in Venice, California just as it's about to go into the cereal graveyard. You might still be able to find it at 99 Cent Stores and similar after-market outlets. This is strictly a novelty cereal. If you get some, know that you're buying it for the box and not the cereal inside. The tweeny actors on the box might be cute, but there's nothing cute about the cereal itself beyond its star-shaped pieces. The taste and texture? 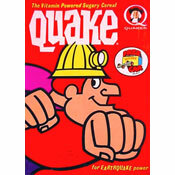 Imagine if a saboteur infiltrated the Cap'n Crunch cereal factory and messed with their machinery. This cereal is billed as "vanilla-flavored", but you have to really concentrate to sense even the smallest hint of vanilla. It's really a sugar-flavored cereal. That's fine, but large sugar granules on the pieces add an unwanted grittiness to the texture of the cereal. Overall, this is a pretty sad product. If you want to have breakfast with Zac Efron and Vanessa Hudgens, I'd recommend getting a box of this cereal and looking at the box while you eat a bowl of Cap'n Crunch or a better cereal. If you wanna have breakfast with Ashley Tisdale and Corbin Bleu, I'd wait two years and go to Denny's... where they will probably be working by then. ("Ouch! Snap!"). 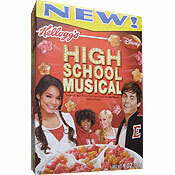 What do you think of High School Music Cereal? It's not great in milk, but this cereal is awesome dry! The taste is very subtle so the milk washes it away, but when you eat it right out of the box its good not overly sweet. I don't care for the grittiness of this cereal. Yea, yea it was very very bad.